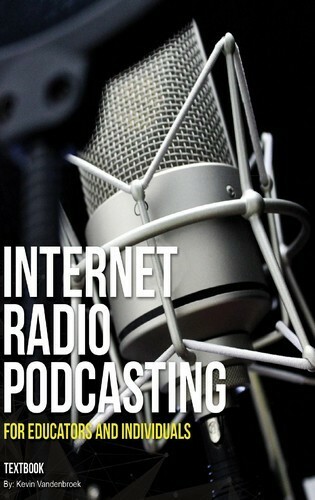 Larry Berger is the Executive Director of SLB Radio Productions and an industry veteran in Internet Radio Broadcasting. Below is an extract from the e- book ‘Internet Radio Podcasting For Educators & Individuals’ by Kevin Vandenbroek where he shares his experiences in broadcasting. “I can remember loving radio from the time I was a child as young as 4 or 5 years of age. At the age of 12, I stumbled on a re-broadcast of old-time radio shows on a new noncommercial radio station here in Pittsburgh. I telephoned the station to provide my address for a copy of its program guide. In those days, the early 1970’s — many noncommercial stations had “quilt” program schedules with different types of shows on different days and day parts. When it arrived in the mail, I studied the program guide to learn that there were shows devoted to Pittsburgh’s Native American population, jazz, blues, Celtic folk music, Caribbean music, women’s issues, bluegrass and more as well as bilingual programs in French and Spanish. It was fascinating to listen to. The station also frequently asked for volunteers. One day when we were on an errand about 5 blocks away from its studios, I asked my mom if we could visit. She agreed and I was warmly welcomed. Days later, I became a volunteer at the station and remained one for the next 28 years. At the beginning, I was mostly interested in technical work (soldering, troubleshooting, etc. ), but as I got older, I fell in love with being the board operator for our bilingual hosts and others who had much to say, but little desire to learn the intricacies of operating the controls. I was in the opposite situation as someone who felt he had little to say, but had a strong desire. It was a perfect blending of skills and interests. Over time, I started learning more about the virtues of noncommercial radio as well as the creativity radio itself allowed. At 18, a friend and I developed a concept for a Saturday morning radio program that would combine music, puzzles, interviews, performance, on-air phone calls and conversation. In 1978, these were very unusual elements for an FM radio program in the U.S., let alone a program on a public radio station. This was the beginning of The Saturday Light Brigade. The program fast became the station’s highest rated in terms of audience size, loyalty and listener support. After winning twelve awards and a national distinction as the best local radio program in the country, we decided to form SLB Radio Productions, Inc., to grow our work. Thirty-five-plus years later, we’re still going strong and are now a company of twelve people. While The Saturday Light Brigade is still a big part of our work and is today distributed to six terrestrial stations and multiple online services, we also work with thousands of children and youth annually as we use the tools and methods of radio to promote self-expression, teamwork, critical thinking, process-oriented learning and other 21st century skills in programs that include documentary creation, oral history collection, and live performance. It’s important to point out that I have had outstanding mentors throughout my radio life, especially in my teens. All of our staff at SLB similarly work to be mentors to the youth we apprentice, and we have been around long enough to see the results of our work. While a few students we work with have pursued journalism or broadcasting careers, our main objective is to support the broad learning objectives noted above. In some cases, we are simply facilitators with the job of setting up a safe environment that will encourage authentic self-expression by children and youth. Examples here would include a classroom or field trip visit where we are primarily interested capturing thoughts and ideas. In other cases — oral history collection, documentary creation, etc. — we have developed lesson plans and curricula to guide the experience. Regardless, we focus most on the process of teaching and participation. While we’re thrilled with the quality and amount of the audio work products emerging from our work, we generally regard them as “byproducts” of successful methods. While youth may not be consuming as much terrestrial radio (or television for that matter) as prior generations, it is our experience that youth still holds radio and audio programming in high regard. For one, it’s a tremendous equalizer; all can participate regardless of physical capabilities or appearance. Radio also is cost-effective. Absent lighting, camera angles and other considerations associated with a video, radio gives students the opportunity to focus on their message, connect with an audience and sharpen their production skills in a relatively controlled environment. Lack of a camera also allows privacy if students wish to present information that, while accurate, may be more appropriate not to attribute. For example, a student roundtable on violence becomes possible on the radio, especially if first names are used and the conversation is appropriately edited. Students also are engaged listeners when it comes to consuming audio media. I can remember a school assembly where a colleague was presenting a short student-produced film featuring ideas from student interviewees from throughout the school. The middle school audience could not contain itself and laughed at the appearances of the school, their classmates, and school staff members on the large auditorium screen. With slight concern about my prospects for success, I took the podium as the next presenter and explained that I would be sharing a vox pop production in which students collected opinions and ideas from throughout the school. As the audio began, the room became completely quiet with the occasional exception of students telling their peers to be quiet so they could hear better. A successful program goes far beyond mastering the technology. SLB and others throughout the world have spent years developing methods and projects that work. Before jumping in, learn more about programs that have been successful and, if possible, contact people who can help you. SLB works with hundreds of educators annually in relationships ranging from providing professional development to teachers to telephone consultations to actually conducting the project as guest instructors. When we’re asked to conduct a project as part of a school-day class (as opposed to an extra-curricular club), we work hard to understand what the classroom instructor may want — or not want — the lesson plans to include. For example, as part of a social studies class, we helped 11th graders learn more about the Vietnam War through an oral history project where they interviewed veterans. While we touched on the technology used to record and edit the audio, the classroom teacher made it clear that the goal was develop interviewing and listening skills as well as learning through veteran first-hand accounts, and that curriculum constraints could not accommodate the project becoming a technical one. Rather than editing their captured audio, students listened and indexed their recordings with time stamps indicating what was most relevant to them, after which our staff did the heavy lifting with respect to editing. Had this been done in a media class or club setting, it would have been appropriate to have the students do all of the work. I always tell students (and parents) that — while some of our youth have gone on to become journalists; it is not our intention to train the next generation of reporters. Our methods sharpen 21st-century learning skills that include speaking, listening, reading, writing, research, teamwork, data evaluation, understanding of an audience, and deadline and process compliance as well as concepts important to STEM, media consumption, and ethics. Students develop empathy as well as a sense that their voice matters as their confidence grows as they gain experience. This is why I believe it is so vital for educators and teachers to consider Internet radio and Podcasting to be such a wide-ranging tool to place in one’s curriculum“.